These crescent shaped pastries are one of my favourite holiday treats. The dough comes together beautifully, they’re fun to make and absolutely addictive. With a ratio of one part butter, one part cream cheese, it’s no wonder Rugelach are habit-forming. The trick to working with buttery dough is to keep it well chilled. Once it comes comes together (super-easy in an electric mixer), it’s rolled into a flattened circle and refrigerated. Many recipes suggest chilling the dough before shaping it, but I find this technique much more manageable. 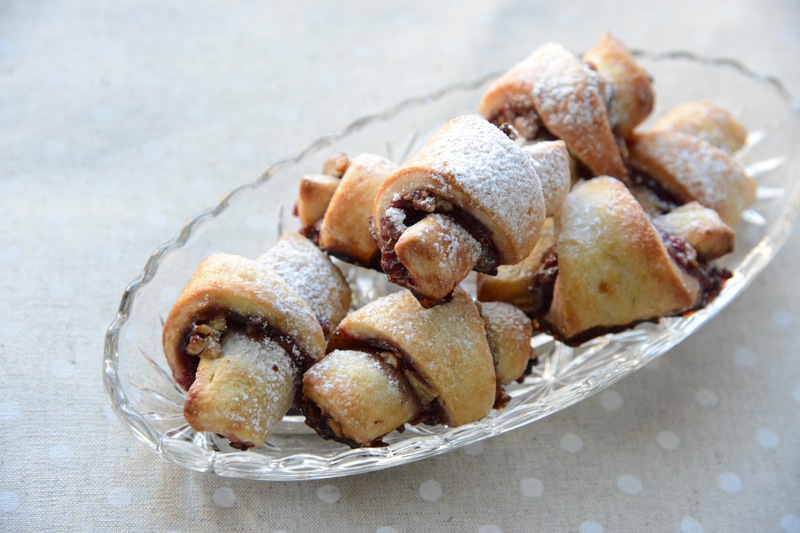 I’ve filled these Rugelach with raspberry preserves but poppy seed paste, chocolate, dried fruit or raspberry preserves are delicious fillings too. Rugelach will keep up to four days in an air-tight container but in our home, they don’t last that long. In a bowl of a stand-up mixer (fitted with a paddle attachment), or a medium bowl, beat the butter, cream cheese and lemon zest until fluffy, about 2-3 minutes. Beat in the sugar, salt, vanilla and egg yolks until well combined. Gradually add the flour and mix until combined. 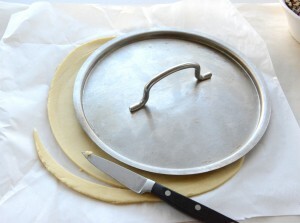 Scrape the dough from the bowl, divide into thirds, and shape each portion into a disk. Working with one portion at a time, place the dough on a sheet of parchment lightly dusted with flour. Cover with another sheet of parchment (or plastic wrap) and using a rolling pin, flatten the disk into a 10” diameter circle, about 1/4” thick. Use a saucepan lid or plate as a template to cut the dough in a perfect circle. If the dough is too sticky to work with, place it in the fridge to firm it before trying again. Cover and refrigerate until firm, at least two hours or up to 24. Repeat with the remaining dough. In a small bowl, combine the nuts, dried fruit, sugars and cinnamon. In a separate bowl, stir the preserves. If it’s too thick to spread easily, thin with a bit of water until it reaches a spreadable consistency. Rolling the filling in the pastry. 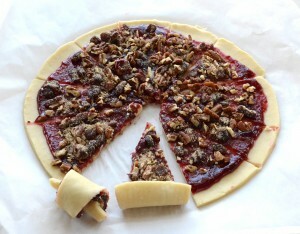 Working with one shaped portion of dough at a time, spread a 1/4 cup of jam onto the circle, leaving 1/2” border. Sprinkle 1/2 cup of the filling mixture over the jam. 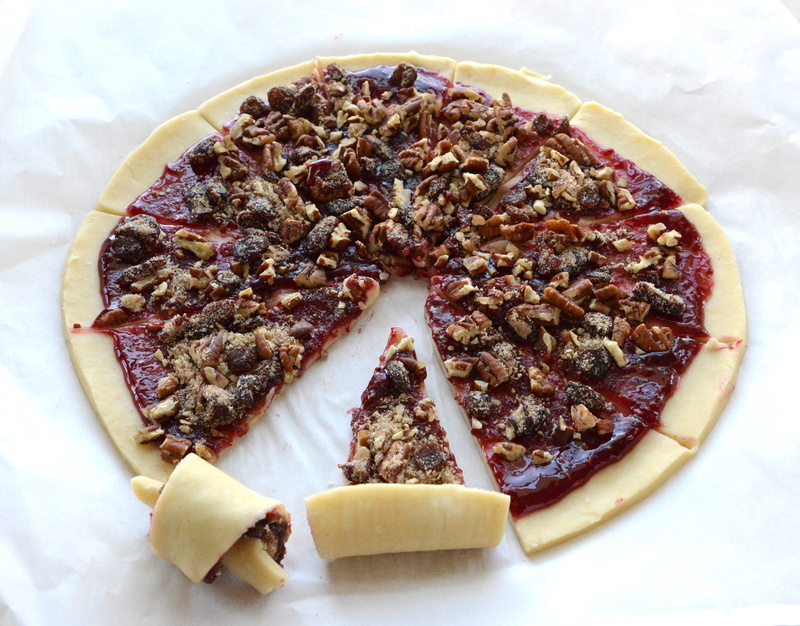 Cut the dough into 12 pie-shaped wedges. If the dough is too warm to cut, place it in the fridge to firm. Starting from the wide end, roll up each wedge, like a croissant. Place about 2 inches apart on a prepared baking tray. Brush with the beaten egg and sprinkle with sugar. Refrigerate for 30 minutes. Repeat with the remaining dough and filling. Bake in a preheated 350 F oven for 20 – 25 minutes or until golden brown. Cool on a wire rack and dust with icing sugar, if desired. The first time I made toffee, it turned out beautifully: a crisp sheet of caramel-coloured ice that snapped into shards of buttery bliss. The second time I made toffee, it crumbled in my hands. The third time, it turned a grainy mess; the forth, it wouldn’t firm …. I’ve had my issues with toffee. Fortunately, I discovered a few tips and tricks along the way to help you get it right the first time — and the second and third. Temperature plays a key role in candy-making. Here in Vancouver, we enjoy a temperate climate, with plenty of humidity. 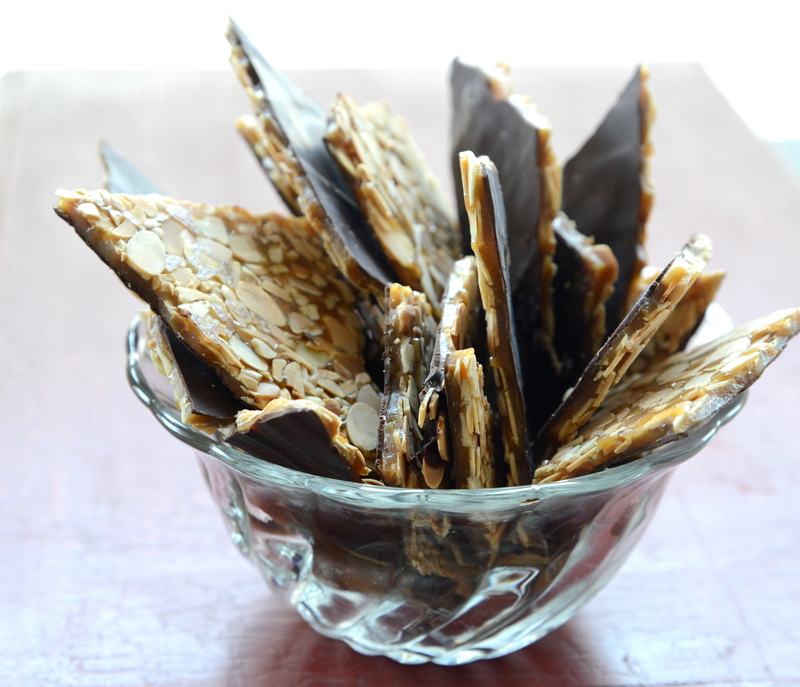 Candy doesn’t work best when it’s too humid so take this into consideration when making toffee. If it’s only slightly humid, cook the sugar a few degrees beyond the recommended 300 F (hard crack stage) for best results. You’ll want to read your candy thermometer at eye-level for an accurate reading. And, at the risk of sounding too pedantic, first test your thermometer in boiling water to ensure it’s properly calibrated (water boils 100°C or 212°F). If you’ve wasted as much sugar as I have, you won’t mind double-checking your thermometer for accuracy. As with any recipe that involves cooking sugar, read the recipe from beginning to end before you start. Then read it again. You’ll need to have your ingredients measured and your tools in reaching distance before you start. And, make sure to use a heavy pot, otherwise you risk burning the sugar. 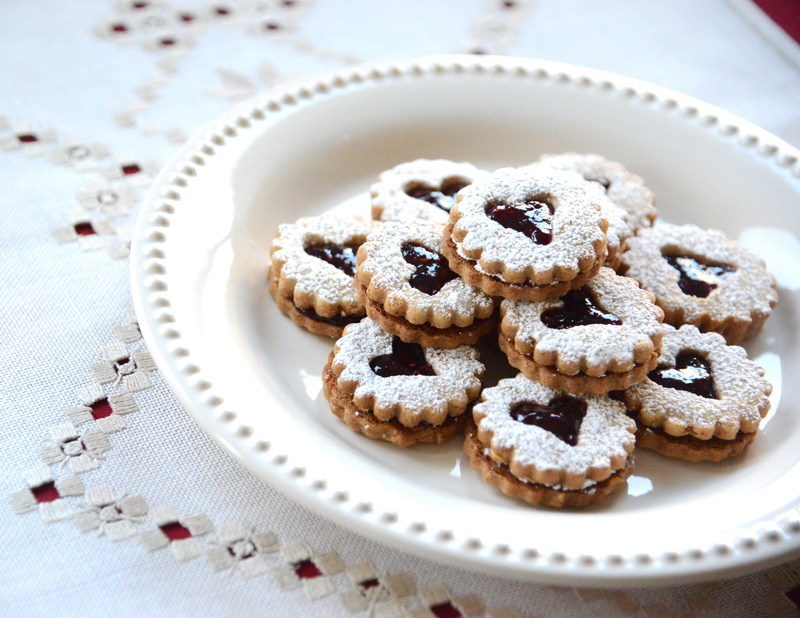 It may seem like a lot of rules for a little treat, but the recipe is really easy, comes together quickly, and is sure to become a holiday favourite. Spread the nuts on a parchment-lined baking sheet, in a single layer. Bake about 7 – 10 minutes until the nuts are golden and aromatic. Set aside. When they’ve cooled, ensure the nuts are spread evenly on the parchment as you’ll be pouring hot toffee directly onto them. In a deep, medium-sized heavy saucepan, melt the butter over medium heat. Add the sugar, water, molasses and salt. Gently stir to combine then clip a candy thermometer to the side of the pot, ensuring the thermometer does not touch the bottom of the pan. Once the mixture starts to boil, stop stirring. Brush down the sides of the pan occasionally with a pastry brush dipped in water to wash down any sugar crystals. Cook the toffee until the mixture reaches a few degrees over 300F on a humid day and 295F when humidity is not an issue. Remove the saucepan from heat, and working quickly, stir in the baking soda. This will cause the sugar to bubble up so be very careful. Pour the mixture over the almonds. Use a lightly-oiled off-set palate knife to spread the toffee, if necessary. When the toffee has firmed a bit and is still warm, spread on the melted chocolate. Allow the mixture to cool, then break into pieces. Keep in an airtight container in a cool dry place. Lasts several weeks. Potato pave, terrine, gratin — it’s all the same: layers of thinly sliced potato laced with cream, butter, a hint of cheese and baked until fork tender. In this recipe, I’ve alternated new potatoes with sweet potato for a striking presentation. Simple, decadent and well worth the splurge. The process is perfectly straight forward but best suited to those blessed with patience in the kitchen — and a mandoline or vegetable slicer. If you enjoy the challenge of tile work or jigsaw puzzles, you’re going to enjoy assembling this terrine. Once the terrine is made, it can be baked, cooled and kept in the refrigerator for days. The terrine can be reheated in its container or sliced as needed and placed in a hot pan until the edges are crisp and the center warm. 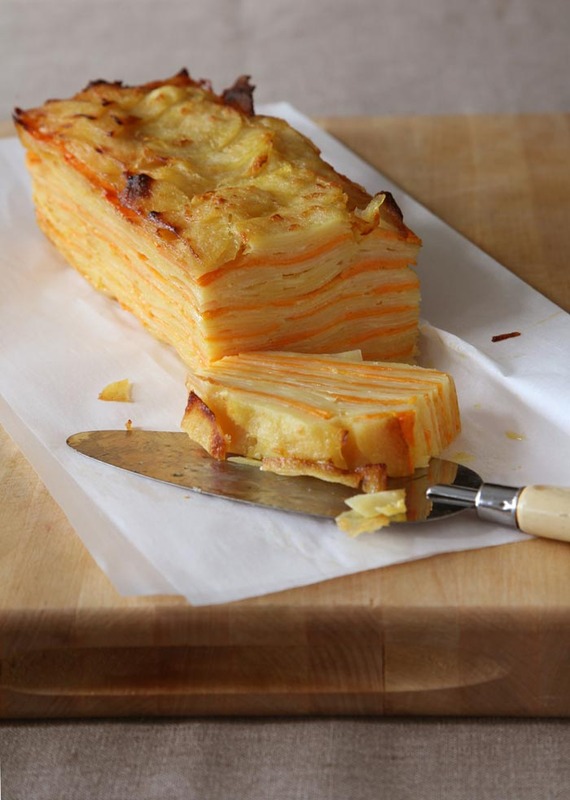 This recipe was inspired by a picture of Pommes Anna (a layered potato pie) found in the beautiful book, The Food of France: A Journey for Food Lovers. Brush the mould with melted butter (this helps the parchment stick to the mould). Line the mould with the parchment, leaving an overhang of a few inches. The excess parchment will help you remove the potatoes from the mould in one perfect piece. 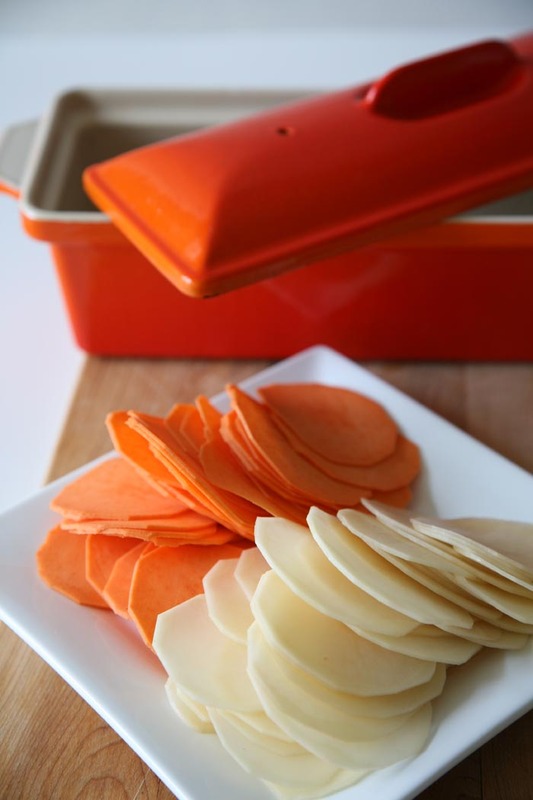 Thinly slice one potato and one sweet potato approximately 1/16” thick using a mandoline, vegetable cutter or sharp knife. Slice more potatoes as you work or, if you wish to slice them all at once, keep them covered with water to prevent them from oxidizing and turning dark. Pat them dry before assembling the terrine. To make sure the potatoes fit snuggly along the terrine edges, cut some of the sliced potatoes in half and place the straight sides against the terrine’s edge. This will help keep the layers uniform. Layer the terrine (as follows), pressing on the terrine now and then to ensure the layers are firm, otherwise it will not hold its shape. Note: only the sweet potato layer is seasoned with salt to prevent the terrine from becoming over-salted. Place 3 layers of potato slices, each brushed with a thin layer of melted butter, into the bottom of the terrine. 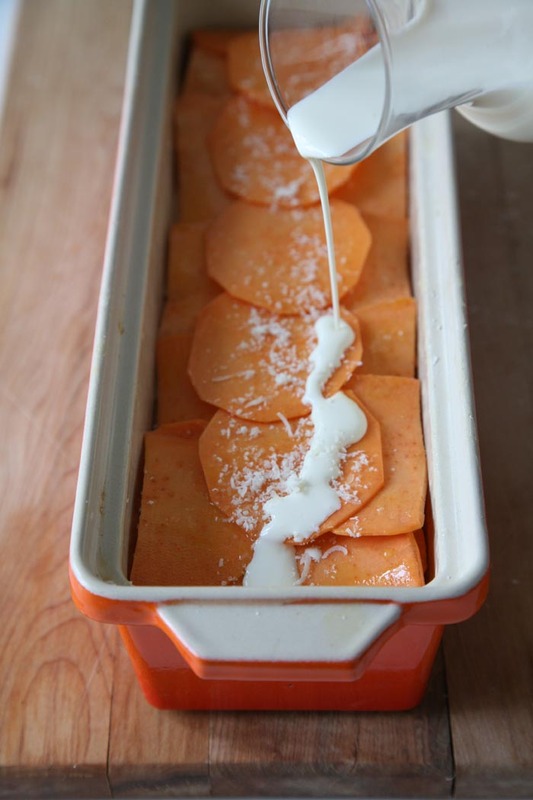 Drizzle third potato layer with 1 Tbsp cream and sprinkle evenly with 1 ½ teaspoons of Parmesan cheese. Add 1 layer of sweet potato, brush with a thin layer of melted butter and sprinkle evenly with a pinch of Kosher salt. Repeat until the terrine is filled. Bake the terrine, covered, in the oven for one hour. 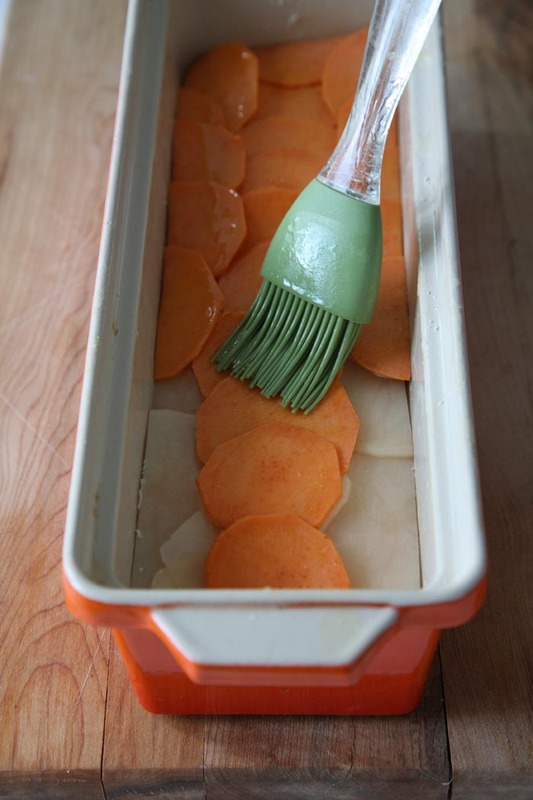 Remove the cover and continue baking until the potatoes are tender when tested with a knife. Allow the terrine to cool slightly and pour off the excess butter and cream before removing the potatoes from the mould. Carefully lift the parchment and potatoes from the mould and transfer to a platter, discarding the parchment. The terrine can be served immediately or cooled, wrapped and refrigerated for up to five days. The terrine can be reheated in a warm oven or sliced and seared in a hot non-stick skillet until the edges are crisp and the centre warmed through. 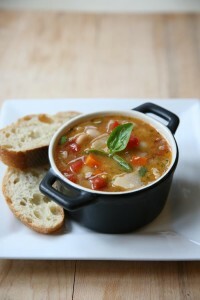 I love Minestrone soup but ordering it in a restaurant is dicey. Often the broth is too weak or tomato-y for my taste and if pasta is added, it’s soggy and bloated beyond recognition. I prefer a robust broth made from tomatoes and roasted chicken stock. I’ve infused mine with Kielbasa sausage and a generous chunk of Parmesan rind. The rind has loads of flavour and the sausage imparts a smoky, garlicky punch that’s anything but timid. Pasta is cooked separately and added to each bowl just before the hot soup is ladled over it. I like lots of last-minute, fresh garnishes on my soup: chopped basil or raw spinach, shaved or grated Parmesan cheese and a generous dollop of “pistou,” a pesto-like sauce updated with piquant jalapeño peppers, shallots, lime and cilantro. This soup packs a lot of flavour and gets even better over a day or two. It’s worth making a big batch. Originally published in Eat Magazine’s Sept/Oct 2011 issue. In a large pot, sauté onions and bacon in oil until the onions are translucent and the bacon is cooked through. Add the cabbage and sauté it at medium-high heat until the cabbage takes on a bit of colour. (The browning of the cabbage adds to the flavor.) Add the garlic, carrots and celery and mix well. If your pan is dry, add additional oil to prevent the vegetables from sticking to the bottom of the pan. Alternatively, if there appears to be excess oil or rendered bacon fat in the pan, remove it with a spoon. Once the vegetables are sautéed lightly, add the stock, Kielbasa, tomatoes, cooked beans, herbs, bay leaves and Parmesan rind (if using). Simmer the soup until the cabbage and the carrots are just tender, but not overcooked. Adjust the seasoning with additional salt, if required. Remove the herb bundle and bay leaves. In a food processor, purée the raw shallot, hot peppers, cherry tomatoes, lemon or lime juice and cilantro. Add the oil in a slow steady stream. The sauce should be quite piquant; add additional lime juice and salt to taste. Just before serving the soup, remove the sausage and cut it into bite-sized pieces. Add a few pieces of sausage and a spoonful of freshly cooked pasta to heated soup bowls. Ladle the hot soup over the sausage and pasta, and to each serving, add a generous spoonful of pistou, shaved Parmesan and freshly chopped raw spinach or basil. Add freshly ground pepper, if desired.